Drug Dependency vs. Curing Disease? Children’s Health Defense Note: This important article exposes how Goldman-Sachs looks at the business model of “cure” vs. “no cure” for diseases. The report asks the question: “Is curing patients a sustainable business model?” CHD is working to change this model. Together, the U.S. government and American families are spending billions on medications, therapy, insurance, education, housing, etc. to address the epidemics of chronic childhood diseases. These include autism, ADHD, diabetes, juvenile rheumatoid arthritis, cancer, allergies (including deadly peanut allergies), autoimmune conditions, obesity and more. The costs are staggering. A recent government survey found that 1 in 45 children ages 3 through 17 have been diagnosed with an autism spectrum disorder (ASD). The estimated average lifetime cost to care for a child with autism is $1.4 million if they do not have intellectual disability. An estimated 1 in 5 persons with autism also has intellectual disability. This increases the average lifetime cost of care to $2.3 million. CHD is calling for a new paradigm that tries to stop the rise of chronic disease and cure those who are suffering now. Since these epidemics are occurring in children, the long-term consequences of so many sick children could be dire for our nation and economy in the future. The rise in chronic illness in children is coterminous with the vaccine schedule. In 1986, there were 11 vaccines and 12.8% of our nation’s children had a chronic illness. 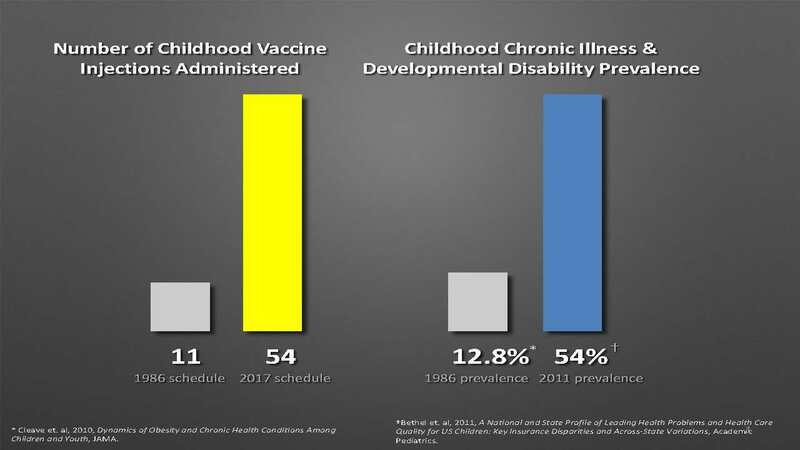 In 2017, there were 54 vaccines—and 2011 figures report an astonishing 54% of children suffer from chronic illness or developmental disability—many of which have been associated with vaccine injuries. CHD believes the U.S. plan must be to do everything possible now to prevent chronic diseases in children and it should start with investigating our broken vaccine program. On April 10th, 2018 Goldman Sachs (GS) released a report called “The Genome Revolution.” In it, GS asked, “Is curing patients a sustainable business model?” People with chronic illnesses and those who have loved ones suffering with ongoing conditions will find the GS comments repugnant. Both childhood epidemics and opioid addiction are at record highs. Partner those facts with the notion that “one shot and done vaccines” are a thing of the past as today’s failing vaccines require more boosters and it begs the question, Could the Goldman Sachs report be exposing pharma’s real end game of drug dependency vs. curing disease? CNBC reported that GS analysts didn’t immediately respond to a request for comment. The Children’s Health Defense is addressing the chronic health issues plaguing our children by educating our communities, leaders and federal agencies to bring about meaningful change on the most important issue of our lifetime—the health and well-being of our children. Everyone—children, parents and family, education leaders and teachers, health care and insurance providers, businesses (like Goldman Sachs and pharmaceutical companies) that employ graduates, our country’s military and more—has a stake in this fight to restore our children’s health. As children are the keys to our successful future and prosperity, we don’t have a moment, or the health of any child, to lose. TLB Editors Note: This is World Mercury Project on steroids! TLB highly recommends you click on the image above, visit this new website, and do whatever you can to help see this new forum succeed … for the sake of our children !!! The above article (Could Goldman Sachs Report Be Exposing Pharma’s Real End Game of Drug Dependency vs. Curing Disease?) originated on childrenshealthdefense.org and is republished here by contribution with attribution to author World Mercury Project Team and Childrens Health Defense.